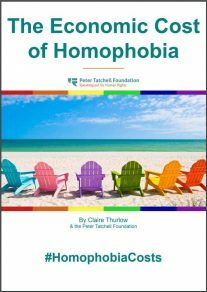 Peter Tatchell, just back from Russia, has launched a new report, with the backing of the Lord Speaker, Lord Fowler, which shows that countries that criminalise homosexuality suffer significant economic disadvantages; lost tourism revenue lost inward foreign aid and investment and lost talent and skills as LGBT+ people flee abroad. The human rights abuses meted out by homophobic nations on their LGBT+ citizens is often solely seen as a violation of human rights. But this report by the Peter Tatchell Foundation reveals that anti-LGBT+ legislation is bad for the economy and the 71 countries that still criminalise homosexuality are losing out on the economic advantages that more gay-friendly nations enjoy. The report, The Economic Cost of Homophobia, doesn’t gloss over the human rights abuses endured by hundreds of millions of LGBT+ people worldwide but conclusively proves that discriminating nations have an economic reason, apart from human decency, to repeal unjust, outdated and unnecessary laws. “The loss of inward foreign aid and investment to countries with anti-LGBT+ laws is considerable. LGBT+ people and allies are less likely to holiday in homophobic countries; potentially depriving these countries of billions in tourism revenue. “There is a brain drain caused by LGBT+ people fleeing from homophobic nations to resettle in more gay-friendly ones. This damages the social and economic vitality of their home countries. “Outlawing homosexuality is encouraging the emigration of highly educated LGBT+ individuals and impacting negatively on tax receipts and innovation through deterring inward aid and investment. “We also show that the multiple forms of harassment and intolerance suffered by LGBT+ citizens within discriminatory countries. This leads to lost productivity in the workplace and damages mental and physical health – which ultimately burdens the state. criminalisation, discrimination, Economic cost, economic development, Peter Tatchell, Peter Tatchell Foundation, tourism.